To ensure security in high-risk and high-privacy environments, SMART solutions encrypts the data with AES 256b, preventing unauthorised user access. Extremely reliable, SMART HRS SSDs are solid state, providing increased performance stability. Ultra-rugged, SMART HRS SSDs can cope with extreme environments that routinely occur in naval and military situations. Designed to meet MIL-STD-810G specifications, SMART SSDs resist potential shock and vibration. Military temperatures of -40°C to 85°C are a standard feature for the SMART HRS drives SMART SSDs are also produced with optional conformal coatings and component underfill, which adds to their consistent performance in differing naval environments. 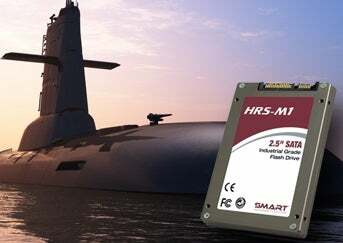 Because naval and military users have a wide array of individual applications, SMART HRS offers a variety of SSDs that provide unique capabilities designed to meet each user’s particular need. SMART HRS has the drives needed for storage applications. If the application also demands a rugged and secure SDET, the SMART HRS S3 is an ideal choice. The SMART HRS S3 can be ordered with up to 1TB of storage. For high reliability, users should consider the SMART HRS M1. It blends high performance and ruggedness in a cost-competitive MLC technology. The SMART HRS M1 can be ordered with up to 2TB. SMART Global Holdings, parent company of SMART Modular Technologies, has announced the appointment of Bryan Ingram, senior vice president and general manager of the Wireless Semiconductor Division of Broadcom Inc, to its board of directors and its Compensation Committee. SMART HRS unveils a feature-rich, cost-effective, multi-level cell (MLC) Flash technology solution to applications requiring high-density storage for use in hazardous and / or critical environments. SMART High Reliability Solutions ('SMART HRS'), a provider of current and next-generation, solid-state storage solutions specialising in ruggedised, high-performance and high-capacity solid-state drives (SSDs) for defence, aerospace and industrial markets, has recently introduced its HRS-M2 2.5in SATA 6Gb/s SSD with pFail (power failure) data protection capability. SMART High Reliability Solutions (SMART HRS), a specialist in ruggedised, high-performance and high-capacity solid-state drives (SSDs) for defence, aerospace and industrial markets, today announced its HRS-M1 2.5in SATA 6Gb/s SSD.